QNAP® Systems, Inc. announced today that Turbo NAS products now support the new WD Red® 5/6TB NAS hard drives and WD Red Pro NAS hard drives. Specifically designed for NAS applications and featuring exclusive NASware® 3.0 technology, the new WD Red and WD Red Pro hard drives provide enhanced reliability and performance for NAS applications. The new WD Red 5/6TB NAS hard drives are designed for NAS systems with up to 8 drive bays and can easily meet the growing data storage demands of SOHO and home users. The WD Red Pro NAS hard drives are designed to provide affordable, robust and highly-reliable hard drives for medium-to-large-scale business NAS systems with 8-16 drive bays. "We are glad to offer our users more options in choosing suitable hard drives for their Turbo NAS by fully supporting WD’s latest NAS drives,” said Jason Hsu, product manager of QNAP. “By using the new WD Red hard drives, our users will enjoy higher capacities, greater reliability, and an enhanced WD service." 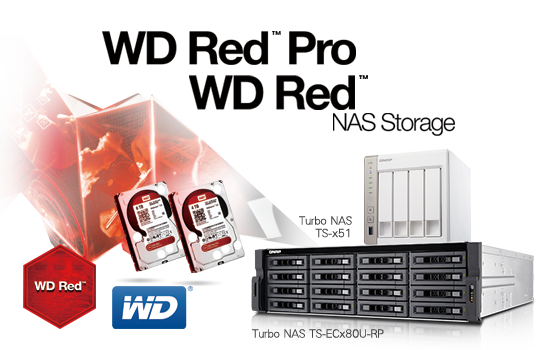 For more information about WD Red NAS hard drives, visit Click Here. Synology® Inc. today announced compatibility results for new WD Red® and WD Red Pro 3.5-inch NAS hard drives, including WD60EFRX (6 TB), WD50EFRX (5 TB), WD4001FFSX (4 TB), WD3001FFSX (3 TB), WD2001FFSX (2 TB). After comprehensive stress testing, Synology has confirmed the above hard drives to be compatible with selected DiskStations and RackStations from x15, x14, x13, x12, x11, x10 series. Thecus Technology Corp. today announced the compatibility of its NAS and NVR storage lineup with the new WD Red 6TB and WD Red Pro drives. Designed specifically for NAS solutions and featuring NASware™ 3.0, the new WD drives provide robust and highly reliable solutions for the NAS industry. Reaching the highest levels of capacity in storage and boasting improved performance, the new WD Red drives are ideal for SOHO and consumer NAS users (1-8 bays) looking to maximize their storage capabilities. For medium to large-scale enterprise NAS systems (8-16 bays), the WD Red Pro drives are designed to tackle more advanced storage challenges and feature Advanced Format Technology and Hardware-based Vibration Compensation. QNAP® Systems, Inc. today announced the availability of Virtualization Station: an industry-leading integrated virtualization operating platform that empowers the Turbo NAS to host multiple virtual machines (VMs). With a simple & centralized management interface, it is easy for anyone to create and run multiple VMs on a single Turbo NAS. Virtualization technology allows users to create isolated VMs on a single server and install different operating systems and applications. Each VM can be viewed as an independent PC that consumes dedicated CPU, memory, disk space and network resources without interrupting each other. Users can flexibly install Windows, UNIX, Linux, or even server-grade operating systems to centralize various services, applications and server management. Virtualization Station is a powerful and hands-on NAS-based virtualization platform that centralizes virtualization management to enhance IT efficiency. Different from typical virtualization platforms, Virtualization Station is designed not only to be beneficial for businesses but also accessible for general users. The web-based management interface provides greater convenience for users to access and manage the Virtualization Station remotely with any device. “Implementing a virtualization platform on a NAS greatly extends applications and benefits for both business and personal use including reducing physical server maintenance, managing applications via web browsers, building a web server, and flexibly installing multiple operating systems,” said Alfred Li, product manager of QNAP. “With the Virtualization Station, users can carry out more operations on a single NAS and complete tasks more efficiently, enjoy high performance for I/O-intensive data access, and secure backup management at the same time,” added Li. Virtualization Station offers major functions of virtualization applications, including, snapshot, VM import/export, providing VMs with dedicated bandwidth, user permission settings, and more. Users can conveniently operate VMs as remote desktops via web browsers for instant management or troubleshooting. Virtualization Station also provides a flexible solution for Virtual Desktop Infrastructure (VDI), creating multiple independent desktops for users to work on or access data on the NAS from anywhere. Virtualization Station’s screen sharing technology also enables users to share the same desktop content to optimize VM utilization. Data on the Turbo NAS can be directly retrieved through the operating systems on the VMs, improving the level of security as no data used by a VM is transmitted externally. Administrators can create users and set proper permissions for each VM, helping to efficiently manage and allocate VM resources for users with different needs. With these permissions, users can work independently on their VMs without worrying about their work being interrupted. In addition, the Virtualization Station supports numerous VM formats and is compatible with virtual appliances from providers such as VMware Marketplace and Bitnami. 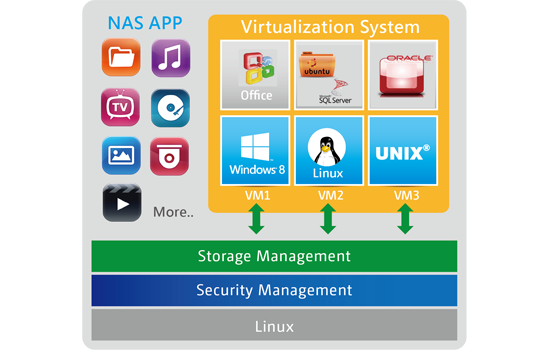 Virtualization Station enables users to expand the applications and features of their Turbo NAS by leveraging the potential of VMs. Coupled with the excellent I/O performance, comprehensive backup solutions and high scalability of Turbo NAS, users can work with higher productivity, greater flexibility and benefit from the many advantages that an integrated virtualization solution can provide them with. TS-ECx80 Pro, TS-ECx80U-RP, TS-ECx79U-RP, TS-x79U-RP, TS-ECx79U-SAS-RP, SS-ECx79U-SAS-RP, TS-x51, and TS/SS-x53 Pro series. QNAP® Systems, Inc. today announced the release of the cutting-edge Turbo NAS TS-x51 series for SOHO and Home users, and two economical tower storage expansion enclosures companion UX-500P and UX-800P. The TS-x51 series, available in 2, 4, 6, 8-bay models, features unrivaled real-time and offline Full HD video transcoding capabilities, and supports video streaming through DLNA, AirPlay and Plex Media Server. “Building a personal cloud is becoming increasingly popular, and the TS-x51 series is the ideal choice for users to quickly create a secure personal space for file storage, backup, synchronization and multimedia,” said Jason Hsu, product manager of QNAP. Coupled with flexible storage expansion support, the TS-x51 series is the perfect solution for the growing needs of data and multimedia content storage in modern small offices and home environments. The TS-x51 series is powered by a Dual-core Intel® Celeron® 2.41GHz processor with 1GB energy-efficient DDR3L RAM (expandable to 8GB) and supports dual LAN ports that provide up to 220MB/s read & write speeds. It maintains smooth system operations even during intensive data access or heavy multimedia streaming. The DDR3L RAM features low volt and low power consumption, beneficial to energy saving while sustaining high system performance. The TS-x51 series, with built-in hardware acceleration, demonstrates superior real-time and offline Full HD video transcoding capabilities to convert video on-the-fly or in the background to universal formats that can be smoothly played on computers, mobile devices or Smart TVs. In the event of limited Internet bandwidth, users can still enjoy smooth videos by selecting a lower resolution to play the videos via File Station, Video Station, or the Qfile mobile app. The TS-x51 series allows multiple users to simultaneously watch different videos stored on it without affecting the performance of other running applications. “The powerful transcoding feature of the TS-x51 series helps greatly save on mobile Internet access bills,” added Hsu. 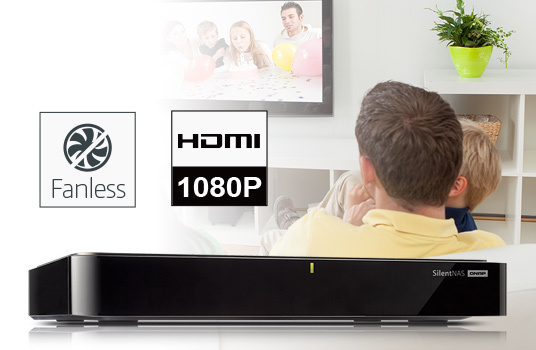 Users can also connect the TS-x51 to the HDTV via HDMI connection to enjoy high resolution videos with the HD Station. Those who are in different rooms from the TS-x51 series in a home environment can stream videos through DLNA, AirPlay or Plex Media Server and enjoy on HDTVs, smartphones and tablet devices. The TS-x51 series is perfect for creating a home multimedia hub. 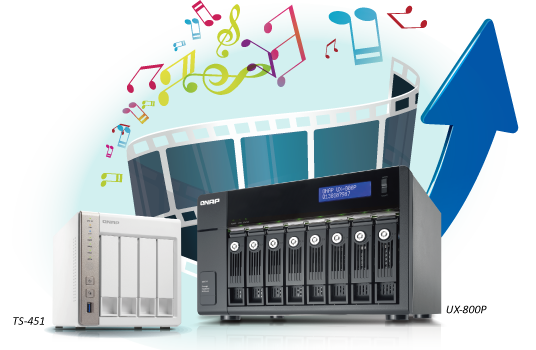 By using the Photo Station, Music Station and Video Station, users can easily archive, manage and share all of their photo, music and video collections. The new series is also an all-in-one NAS, featuring the app-oriented QTS operating system that allows users to centrally organize files & backups, sync files across various devices, share files with different groups & communities, and access & manage files on the go using the Qfile, Qmusic, Qmanager and VMobile mobile apps. With the constant growth of digital data and increasing demand for digital multimedia, small office and home users expect high performance and flexibly expandable storage solutions. The TS-x51 series supports storage expansion, allowing administrators to connect a QNAP expansion enclosure (UX-500P or UX-800P) to increase the total raw storage capacity up to 80TB (varies by models). The new tower expansion enclosures UX-500P and UX-800P offer small office and home users budget-friendly options to enjoy greater flexibility in storage deployment. “Users can easily adopt the UX-500P and UX-800P to effortlessly set up and expand the storage capacity of the TS-x51 series to fulfill the large storage capacity required by file backup, multimedia and video surveillance,” added Hsu. Users can also increase the functionalities of the TS-x51 series with the QTS App Center that provides various install-on-demand apps developed by QNAP and third-party developers, including backup/sync, business tools, content management, communications, download, entertainment and more. QNAP’s development platform also allows developers to create various applications, adding even more value to the TS-x51 series and providing near-unlimited functionality for users. QNAP® Systems Inc. today announced the release of its Silent NAS series addition, the HS-251, designed for the living room with powerful hardware, a wide range of multimedia applications, real-time and offline Full HD video transcoding, and HDMI connectivity for local playback. Housed within a stylish & compact set-top box design without a fan inside, the silent HS-251 is the perfect choice for those looking for the perfect living room NAS, as well as a Home Theater PC/NAS combo. Network-Attached Storage (NAS) has become increasingly popular in home environments, but normal NAS are mostly available in heavy and sometimes unwieldy boxes that are too big & noisy for being an integral part of a digital lifestyle and living room. With the HS-251, QNAP delivers a silent & stylish NAS that fits alongside HDTVs, cable boxes and game consoles. With HDMI output and powered by an Intel® Dual-Core Processor, the HS-251 brings the NAS fully into the living room by providing the power, connectivity and apps for users to enjoy a brilliant entertainment & centralized storage solution. "With its powerful dual core processor, HDMI connectivity and completely fanless design within a set-top box: the HS-251 is a marvel of engineering," said Jason Hsu, product manager of QNAP, adding "This amazing product is coupled with an unrivalled set of apps & software features that will allow home users to enjoy a perfect home theater experience, secure & centralize their files & data, and much more." The HS-251 provides HDMI output that allows users to connect to an HDTV or Hi-Fi amplifier and to use the HD Station to enjoy rich multimedia content with the best audiovisual experience. The HD Station features a powerful XBMC-based home multimedia player that enables users to enjoy the video, music and photo collections stored on their HS-251, watch YouTube and surf the web with the Qremote mobile app or MCE-compatible remotes and wireless keyboard & mice. The HD Station turns the HS-251 into a total home entertainment experience. With on-the-fly and offline Full HD video transcoding capabilities, the HS-251 is the best companion for home entertainment. The HS-251 can flexibly convert videos into formats that can be played smoothly on PCs, mobile devices and smart TVs, as well as allowing multiple devices to simultaneously watch different videos. Users can enjoy high quality videos by selecting a suitable resolution via File Station, Video Station, or the iOS® & Android™ Qfile app even when in remote sites with limited/restricted Internet access. Powered by QNAP’s QTS 4.1 operating system, the HS-251 is easy to set up, manage and for everyday use. With its familiar user interface, enjoying multimedia, organizing & backing up files, and syncing & sharing to other devices is easy with no learning process required. And with a wide range of mobile apps, users can enjoy multimedia, access their data and manage the HS-251 anytime, anywhere. The team at HW Legend has been a pillar in the Italian IT media for a while now. They are characterized by their passion for computing and their desire to provide the most up-to-date information on the world of technology. With such a reputation preceding them, let's take a look at what they think about the new Thecus rackmount, the N8810U-G.
One of Thecus’s core values is quality, something seen in all of their devices, and something that is essential especially in SMB NAS, where fast, top-of-the-line performance is a necessity. "The Thecus N8810U-G brings a happy smile to our faces. It works easily with huge amounts of data. We are totally satisfied with the Thecus N8810U-G’s performance." Thanks to Edoardo Giampietro and the team at HW Legend for the review.